Turning empty spaces into people places. You take pride in your property. Keep it looking its best with duraSTRONG exterior rubber paving tiles by sofSURFACES. Slip-resistant and able to withstand the toughest weather conditions, duraSTRONG exterior tiles are equally effective in commercial and residential applications. Choose from duraSTRONG terrace pavers, ballast pavers or access and walkway tiles to ensure a long-lasting and affordable solution for both outdoor living and working surfaces. Durable enough to use in high-traffic areas, duraSTRONG tiles also provide the versatility your project requires. Made from up to 100 percent post-consumer recycled materials and backed by our Limited Lifetime Guarantee, duraSTRONG exterior rubber paving tiles come in a range of attractive earth tones with custom design options available. 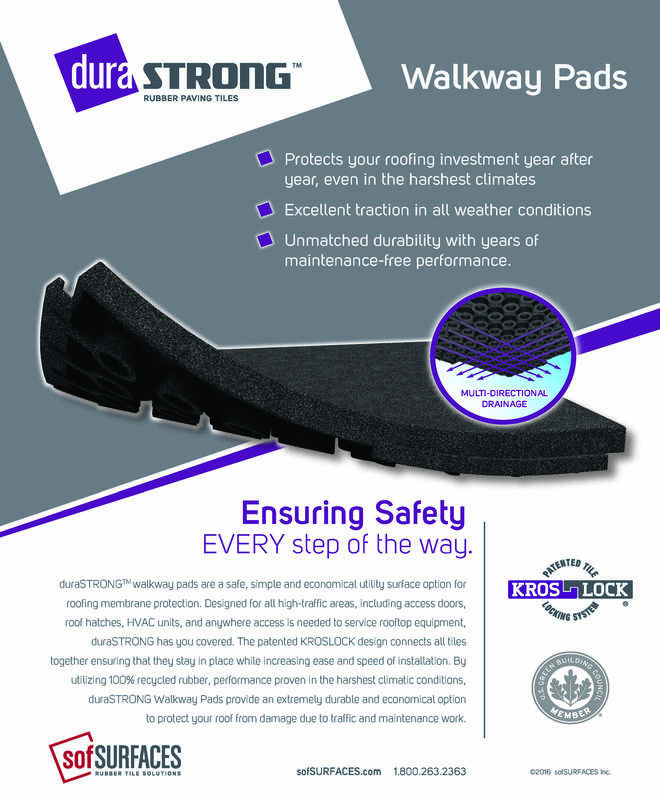 duraSTRONG walkway pads are a safe, simple and economical utility surface option for industrial roofing membrane protection. Designed for all high-traffic areas, including access doors, roof hatches, around HVAC units, and anywhere rooftop access is needed for servicing rooftop equipment, duraSTRONG has you covered. The built-in pedestal design raises the tile off of the roofing membrane while providing excellent multi-directional drainage, cushioning, impact resistance and shock absorption from foot traffic, tool drops and accidental penetrations. Create your custom tile right here! 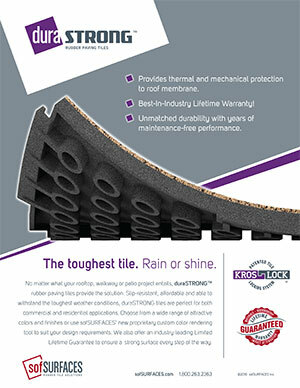 Learn more about duraSTRONG roof paving tile. Click here to download our product sheet.